If you are having problems with the Delphi IDE crashing or being slow on your machine this might be the fix for you. Andreas Hausladen has a utility called IDE Fix Pack for Delphi XE5 Update 2 that came out in December 2013 which modifies the Delphi XE5 IDE to take care of some crashes and to speed it up. Apparently it doesn’t make any file changes or change what is compiled at all. All of it’s changes take place each time you load the Delphi XE5 IDE and only happen in memory. I downloaded it and am using it. I don’t really know if it is speeding up the IDE or not for me because I use some other tricks (like a RAM cache and having a quad core CPU) but overall I think I see less Access Violations when using the IDE than before so it is worth a shot. 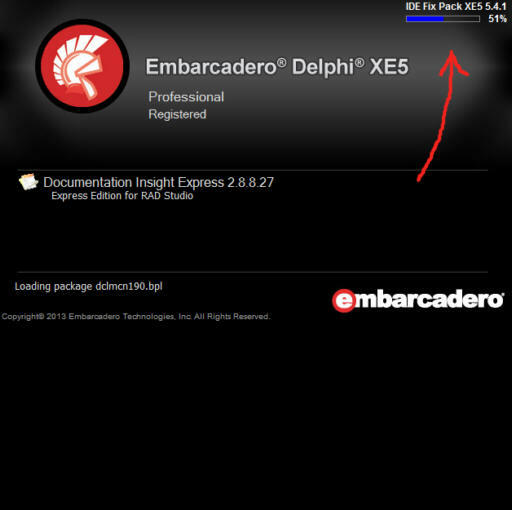 It shows you when it is loading on the Delphi XE5 loading splash screen. His download link only shows around 1000 downloads for XE5 so this could be useful to a lot of you if you haven’t seen it before. Try out the IDE Fix Pack and report back if it speeds up the IDE for you.